Billionaire Mukesh Ambani paid the dues of his brother Anil Ambani's firm, Reliance Communications (RCom), just a day before the stipulated deadline, saving the younger sibling from going to jail. The Supreme Court had given a deadline of March 19 to pay all the dues to Ericsson. Mukesh Ambani paid around Rs 460 crore to RCom's operational creditor Ericsson from his personal wealth to bail out RCom. Anil Ambani publicly thanked his elder brother for the gesture with a statement saying, "My sincere and heartfelt thanks to my respected elder brother, Mukesh, and Nita, for standing by me during these trying times..."
Besides, Anil raised the curiosity of the public, saying that he and his family had "moved beyond the past". The past of the Ambani family is largely there in the public domain. 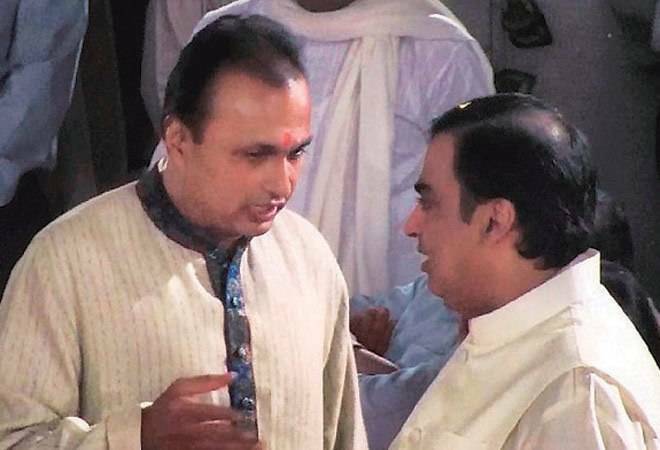 After the demise of father Dhirubhai Ambani, Mukesh and Anil Ambani had fought for the Reliance empire. The family business was eventually divided in 2005, with the mediation of mother Kokilaben Ambani. But, there were a set of court battles and public spats for the natural gas produced from Reliance Industries' asset in Krishna Godavari (KG) basin. Anil wanted the gas at the price mentioned in the family settlement agreement. But as the price had gone up since the agreement, Mukesh was not ready to sell it at the same price to Anil's firm. Finally, in 2010, the Supreme Court gave the verdict in favour of Mukesh's company. With this, Anil's dream of building a huge gas-based power plant ended. Interestingly, the gas production dried up at KG basin soon after. RIL and its partners are still trying to revive it. However, in May 2010, just after the verdict on natural gas by the Supreme Court, the brothers had scrapped all "non-compete" agreements between their companies, allowing either group to enter sectors that had earlier been reserved for one of them. This paved the way for Mukesh Ambani's entry into telecom, launching Reliance Jio. It was rumoured during the time that the brothers made some financial transactions before removing the non-compete clause from their family agreement. But the public soon saw the Ambani family partying together on December 27, 2011, at Chorwad in Gujarat during the 80th birth anniversary celebration of late Dhirubhai Ambani. At that time, sources close to the family said that Kokilaben wanted her sons serving on the boards of each other's companies. After that, the brothers were never seen together in any of the public functions. Mukesh was focused on building the telecom business and other expansions. In 2016, the brothers again united for their niece's wedding. Anil Ambani was happy at one point of time that his brother was coming up with Jio, and said in September 2016 that his telecom company had "virtually" merged with Reliance Jio. "Our spectrum is shared, our network is shared, our fibre is shared, our towers are shared, our voice is shared," he explained, while responding to the questions of shareholders at the AGM of RCom. It was just a few days after the launch of Jio's commercial operations. Mukesh Ambani said in an interview to The Economic Times at the same time, he was "happy" that they had overcome all their past issues at the family level, but added that their businesses were separate. Broadly, these statements were seen by the market as a reunion. But the launch of Jio destroyed the telecom business of Anil. In 2017, at the Reliance Capital annual general meeting (AGM), Anil Ambani termed falling wireless telephony rates as "creative destruction" and not a "disruptive factor". He further added he would fight the attempts to "thwart" RCom's revival strategy. The remark begged the question if Anil was referring to Mukesh. In early July 2017, RCom had blamed Jio directly as the reason for the financial stress in the telecom industry. "The telecom industry's current financial problem to some extent can be attributed to the entry of a new telecom operator (Jio) and its strategy of offering freebies to gain customer and market share," the company said in a notification to the BSE. Soon, RCom started defaulting on its repayments on a debt of Rs 45,000 crore. Its asset sale failed to take off. Finally, Mukesh gave the helping hand and agreed to buy the RCom assets. Jio had announced a Rs 23,000-crore deal in December 2017 and completed the purchase of media convergence nodes and fibre for Rs 5,000 crore last year. But the spectrum sale got stuck after the telecom department sought bank guarantees. Ericsson went to court around this time. Anil Ambani and his family were seen mingling with the elder brother's family during the two recent weddings -- Isha Ambani's with Anand Piramal and Akash Ambani's with Shloka Mehta. Now, the Ericsson case has ended with the intervention of Mukesh Ambani. The shares of RCom, which had filed for bankruptcy in February, jumped 10 per cent on Tuesday, reacting to the news. But, reports say, BSNL will approach National Company Law Tribunal (NCLT) soon to recover their dues of about Rs 700 crore from RCom. It remains to be seen how far Mukesh Ambani can rescue the younger brother and revive his business fortunes.